The Loft Bookshop to close. | Come Here To Me! The Loft Bookshop to close. 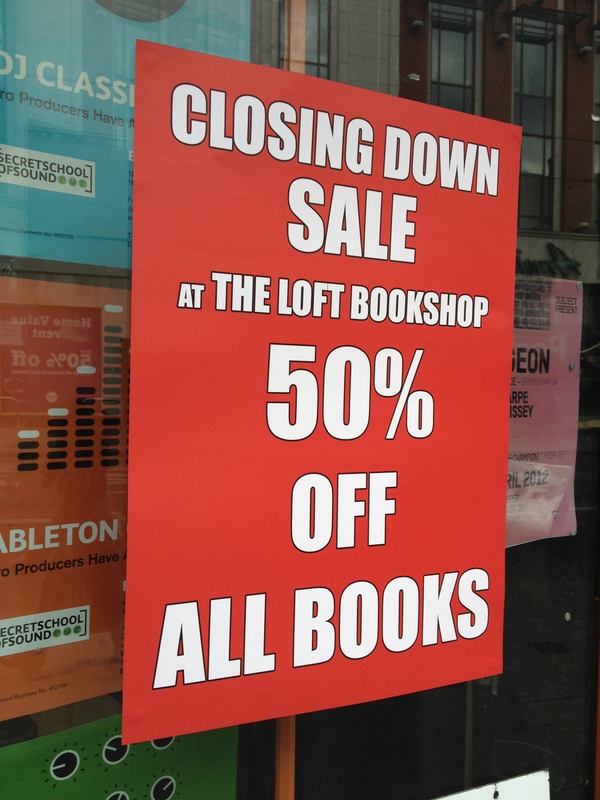 Sadly, The Loft bookshop is to close its doors. The bookshop was a very welcome addition to the Twisted Pepper venue, and the building really began to take on a life of its own in ways other than a nightclub venue in my eyes and the eyes of many other Dubliners. It’s undoubtedly a tough time for book sellers, and this is a good warning of that. Fair play to all involved for giving it a go. Below is the statement from the bookshop. It is with some sadness that, as of this week, I have decided to close up The Loft Bookshop here at the Twisted Pepper. We’ll be finishing up in mid May and as of today we’ll be running a 50% off clearance sale everyday until the doors close. It has been an eventful and challenging year in which I’ve met many wonderful people and experienced the phenomenal support and encouragement of old friends and new. The list of people whose help and good-will enabled me to start up here is long and I’d be terrified to miss anyone out. Suffice it to say, you all know who you are and you’re great! To all you book lovers out there, keep supporting your local bookstores, independent or otherwise, wherever you are. Dublin is a city blessed with enthusiastic and knowledgeable booksellers: Chapters Bookstore, The Gutter Bookshop, Raven Books, The Winding Stair, Books Upstairs, Dubray Books, The Secret Bookstore, Hodges Figges, to name but a few. Go and help to keep them doing what they do best! Seeing the Twisted Pepper get better and better, watching 3FE go from strength to strength both here and at Grand Canal Street, and being here while Elastic Witch Music and The Boxcutter Barber kick off their own ventures has been something to behold. I urge you all to keep supporting the great people here at The Twisted Pepper, supporting all the guys who work so hard, and to help keep it a special place to be in Dublin. We need places like this, now more than ever, and I for one plan to spend as much time as I can this summer hanging out downstairs. Thank you most of all to the customers and who visited the shop this past year. It was a pleasure and a privilege to meet you all. Your business and your support has been deeply appreciated. Sad, I was never there but we need these independent outlets like air. Wishing Rob well and hope the experience will go into the setting up of something even better in the future.